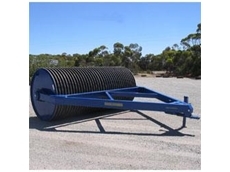 Hay feeders, hay transporters, trailing grain feeders, auger trailing grain feeders, auger super transporters, multi bins, mini groupers, paddock rollers, multi paddock rollers, roller with seeders, harrows and fertilzer. 09/07/08 - Farm Pro designs, manufactures and distributes an extensive range of farm equipment and machinery. 08/07/08 - Farm Pro is a farm equipment manufacturing company that offers design and manufacturing services for a range of trailing grain feeders, hay transporters, hay feeders, rollers, multi paddock rollers and auger transporters. 07/07/08 - Farm Pro specialises in farm engineering and design services for a range of farm equipment and machinery suitable for the agricultural industry.